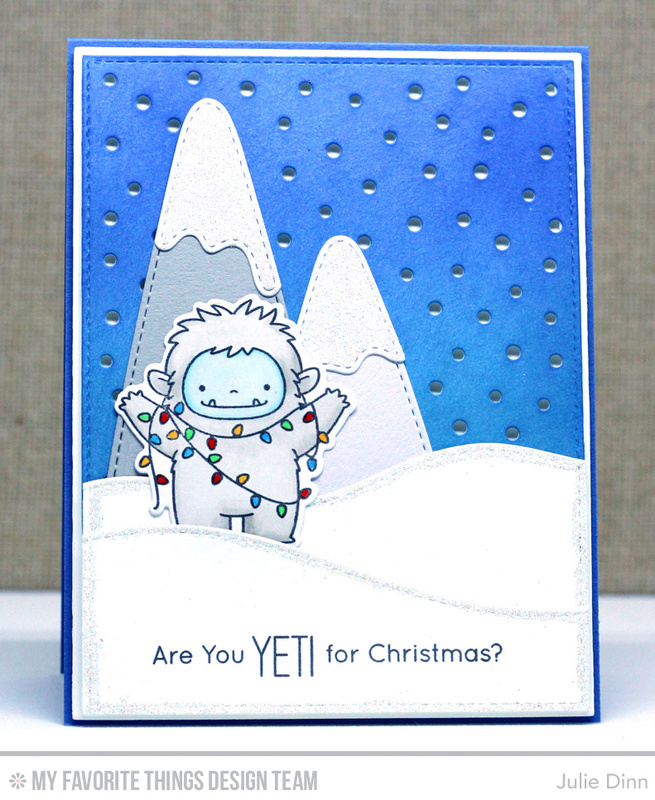 Kreative Jewels: Are You Yeti for Christmas? Thank you for joining me as we count down to the MFT release. We are four days away from the big day! All the new Stamps, Die-namics, and Stencils will be available on Tuesday, October 4 at 10:00 pm EST. Be sure to check out the MFT Blog to see all the new items being revealed today. Don't forget to leave a comment on the MFT Blog countdown posts, YOU could win one of the five $75.00 gift vouchers. I'm guessing you have all caught a glimpse of the adorable new Beast Friends stamp set from Birdie Brown. I bet you didn't know that you needed a yeti stamp until you saw this one! It is so stinking cute! I paired the Beast Friends stamp set and Die-namics with the Snow-Capped Mountains, and Snowfall - Vertical Die-namics. I coloured the yeti with Copics, and added a touch of glaze to the lights. For the background I used the stencil brushes and Blu Raspberry and Cornflower Premium Dye Ink. The card stock was then die-cut with the Snowfall - Vertical Die-namics. I added a touch of glitter to the snow and the mountains. Love the fun idea of a yeti Christmas! Julie, I love the colors! The Cornflower Blue and Blu Raspberry are a knockout against the white! So adorable! The ski is fabulous and really sets off the celebrating yeti!